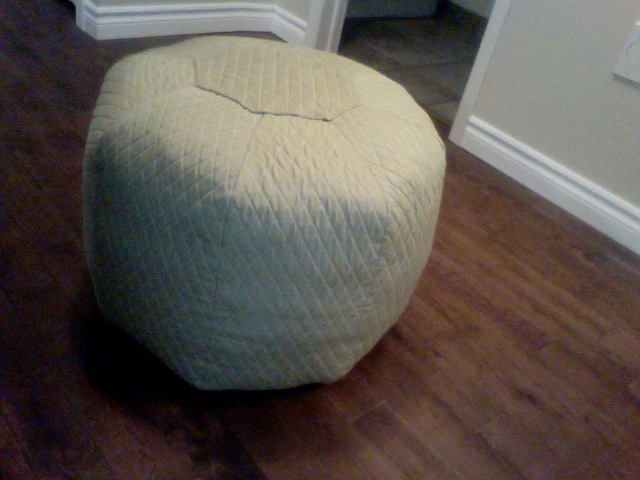 Canadian Home Love: Pouf, it's Done! I seem to have lost my camera on our trip to Indiana to visit my family, so the picture below is taken with the computer camera :( But my pouf is complete! Using Better Homes and Gardens tutorial I whipped up this bad boy over a couple of days. I have to say I'm quite pleased. It's all for the Pouf-a-Long I mentioned here. Besides not having my camera, I didn't document the process, since it was the same step-by-step as the tutorial (minus the decorative stitching - my fabric has a quilted diamond pattern, so I felt there was already enough interest). I started to slow down on the project toward the end as I was having a hard time finding things to stuff it with. In the end I used everything from an old comforter, the poly fill from the dogs' old beds (sounds gross, I know, but it was perfect), old sheets, and poly fill from two small pillows on chairs we plan to garage sale. It was kind of nice to put to good use things that were either going to get thrown out or sold. Gotta love repurposing! Now I have to get to the other sewing projects for the baby's room. Hopefully this thing will all come together before she comes!